Chemistry is popular for being a science of matter. It encompasses not only chemical reactions but also its structure, properties and composition. This specific field of study is more concerned about atoms and how they interact with other atoms as well as chemical bonds properties. Chemistry is also considered by a lot of experts as the central science since it has the ability to connect physics with other essential natural sciences including biology and geology. It should be noted, however, that while chemistry is considered as one of the major branches of physical science, it is still distinctive from physics. Chemistry also encompasses the behavior and structure of atoms, properties and composition of compounds, reactions between substances together with their energy exchange and the specific laws that are capable of uniting the phenomena into a more comprehensive and understandable system. If you want to become successful in the field of chemistry, then note that your work as a chemist involves staying in a laboratory or in a research environment, using experiments to test hypothesis and asking questions so you will have a basis for all your experiments. There are also chemists who work using a computer by developing models and theories about subjects related to chemistry and predicting reactions. As a chemist, you also get the chance to do some field work and contribute advices on projects related to chemistry. You have to be serious in honing your skills in this field so you will have an easier time performing your tasks and responsibilities as an expert in chemistry. If you have longed to become one of the most successful chemists at present, then be aware that enrolling in the chemistry certification program from Brainmeasures can offer you the kind of assistance that you desperately need. Because of the thousands of excellent reviews received by Brainmeasures from all the online certification courses that it offers, you have a hundred percent assurance that its chemistry course is also one of the most effective online certification courses that are now introduced to the public. You can expect this certification course to help you enjoy a kind of chemistry training which covers all the essential aspects related to the field, the specific principles behind the execution of chemistry as well as the best sources of information for this specific field of study. By taking part in the chemistry certification program offered by Brainmeasures, you will get the chance to understand the most essential concepts and theories related to the field especially those that relate to atoms, elements, substances, compounds, molecules, ions and salt, acidity and bacidity. 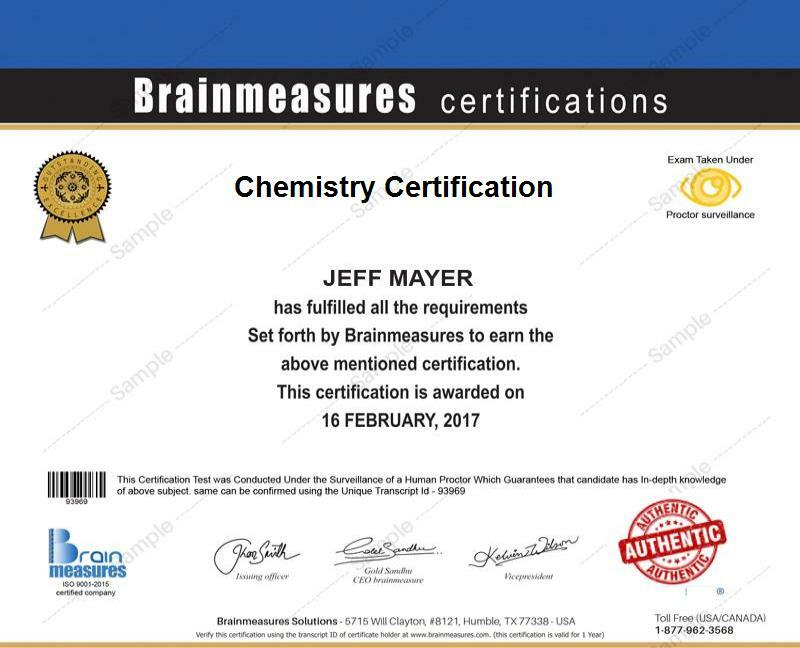 Earning your chemistry certification from Brainmeasures is a major help when it comes to informing the public that your expertise in the field is highly commendable. The chemistry certification program offered by Brainmeasures is guaranteed to be highly comprehensive so it is no longer surprising if various professionals continue to gain benefits from it. This program is most suitable for those who are working in the field of sciences and medicine including chemists, biologists, chemical engineers, physicists, dentists, pharmacists, nurses, doctors, veterinarians and physical therapists. Fire fighters who make fireworks can also receive benefits from enrolling in the program. Holding a chemistry certification allows you to get interesting jobs with a more profitable pay. As soon as you receive your chemistry certification, you can start working as a chemist and earning a more stable income. It should also be noted that your salary as a chemist will be fully dependent upon the specific position that you were able to hold, the extensiveness of your duties and responsibilities, your employer, the level of your experience and your specific location. At present, you can expect to earn around $53,000 to $120,000 per year by working as a chemist.